The first recipe in a long, long time. I hope I don't disappoint you too much. It's been a long time coming but I just have had too much to do on all other levels of my life. It's not that I've stopped cooking during this time. I just couldn't find the time, stamina or inspiration to do everything that's involved with a post. However, I feel that I'm in the mood again - so let's go! This is a very different type of taco to what I'm used to. Normally I'd make them with beef mince but I got to say that this was much more interesting. Tacos is something that goes well with my philosophy of freestyling the cooking, you can basically top them with whatever you like. The fact that I cooked it in the slow cooker means that it was almost no effort at all, another bonus after a long day at work. This could alternatively be served as some kind of Mexican casserole with rice. Heat through some peas and sweet corn and the job's a good 'un. Put the pork in the slow cooker and top with the sliced onion. Put all the wet ingredients and the spices in a blender, or use a hand mixer, and blitz until well blended. Pour this on top of the pork and onions. Cook in your slow cooker on low for 6 - 8 hours. When done to your liking, give it a stir for good measure. Once cooked you can choose to shred the pork, cut it into smaller pieces or just keep it as it is. Your choice, don't blame me! 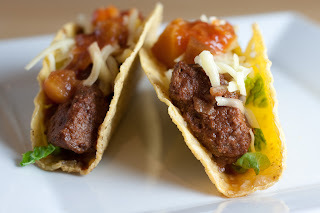 Serve in taco shells and put whatever toppings that rocks your boat under and over the pork.